Good evening fellow scrappers! Today I thought I'd share some of the projects I've made in the past where I've used Clear Scraps products. I've loved the concept of acrylic for a long time now. At first, acrylic may be a bit intimidating since it's see through--but after a bit of experimenting I found that it's this clear nature that makes acrylic such a great product for scrap booking or card making! My first project is actually a new, never before seen criss cross card. I used a scallop acrylic circle by Clear Scraps on this card. I inked it with alcohol inks and dry embossed it. Finally, I wrapped a bit of string around it. A close up of the chippie brick wall. This chipboard is by Dusty Attic. You can find a tutorial here on how I give the brick wall it's texture. Here you can see a better look at the acrylic and the effects/texture the embossing & alcohol inks gave it. The image is a stamp by Kenny K called "Queens Cutie". I colored her in with Prismacolor Pencils. I wish I was better at coloring. I honestly do my own thing when it comes to coloring images. I was actually experimenting with a new coloring method with this image & I ended up with a light/pastel sorta coloring. I liked it though! As usual I dressed up my image a bit more by highlighting parts of her hair and outfit with Star Dust stickles. 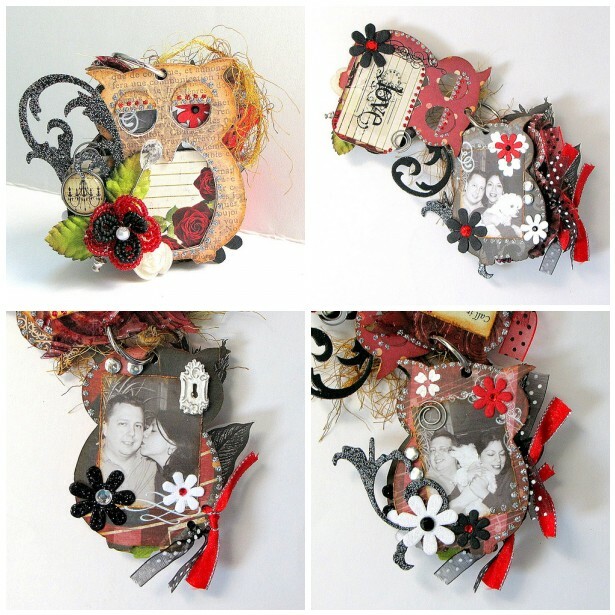 On this next layout I used an XL heart shape by Clear Scraps in the background. I once again used alcohol inks on the edges. Since the heart is see through you can see some of my splatter stamping right through the heart. I also used my crop-a-dile and punched a few holes underneath my photo where I strung a bit of black tulle through. Finally I randomly added a bit of stickles along the hearts edge & also added some eyelets. You can find more close ups & details on this page here. For this page I used yet another XL shape by Clear Scraps. This one is a large scallop circle. For this one I applied a bit of molding paste on the edges & sprinkled some Mahogany Distress embossing powder on it. I then very carefully heat embossed it. As mentioned before, you actually can heat emboss acrylic...but you have to do it with patience. If you just hit your acrylic directly and too close with the heat gun--the acrylic with warp & twist. So you heat emboss it a little at a time and from a good enough distance where it doesn't really warp the acrylic but does manage to emboss. It may take a little time & practice--but the results are really worth it! You can find more details & close ups on this layout here. Finally I have this really cute mini owl album. The entire album is made from acrylic and is also by Clear Scraps. This lil' guy measures approximately 3" inches in height! As you can see from the various photos...I did a couple of things here. I adhered paper directly onto the acrylic, I embossed some of the acrylic, I applied some alcohol ink, I punched holes and thread ribbon through it & I applied stickles along the edges. I really love how this little keepsake album came out! You can find more photos, details & how to's on this mini album here. Such a beautiful work!! I love all the detais! !